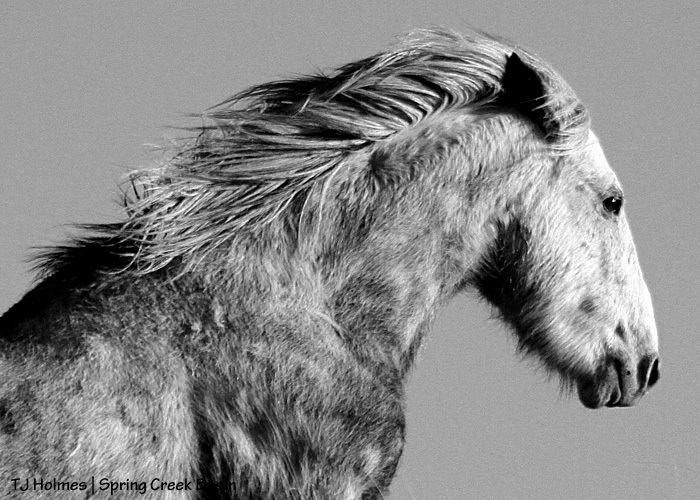 To contrast the previous high-energy image, here’s another grey stallion. 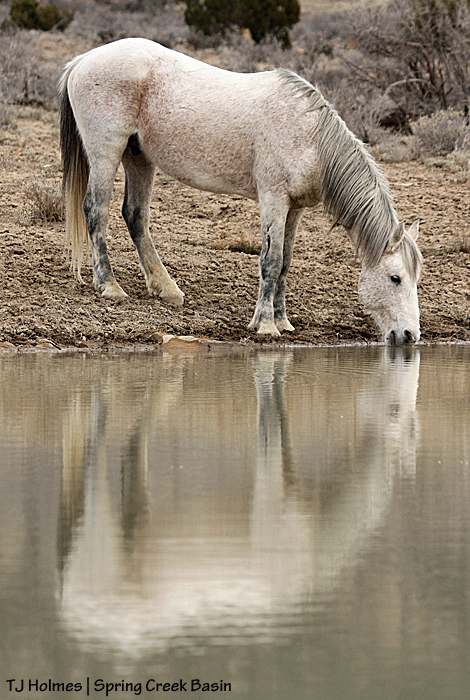 This is our beloved Grey/Traveler, drinking at one of the ponds. His band also drank, but I loved the simple look of him and his reflection. Ty in shades of black and white and grey. He was in hot pursuit of Copper, who was getting too close for comfort. Not only are these University of Missouri students good workers, they’re good luck! They arrived with smiles and good cheer and high energy, and we know why. 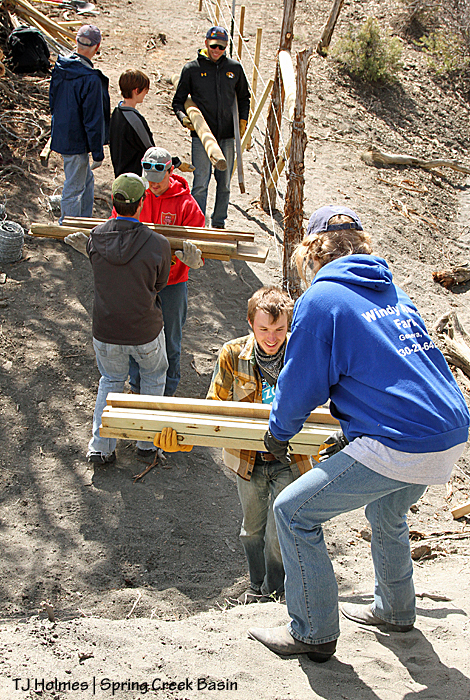 Wednesday’s stretch of fence work was fairly short, especially compared with Tuesday’s stretch. 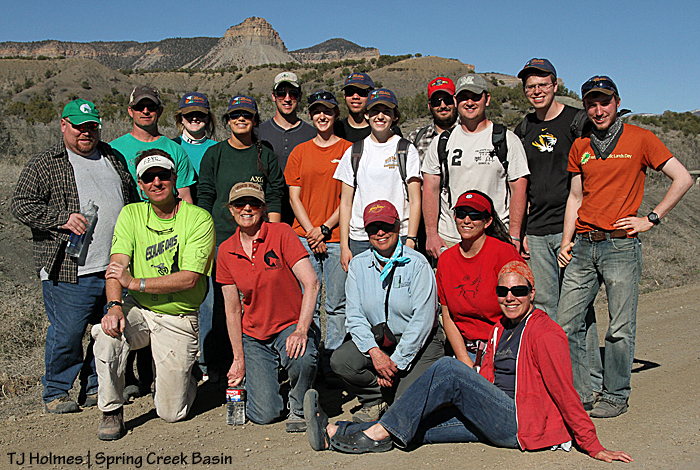 The goal was to finish relatively early, then take the students to the interior of Spring Creek Basin to see the reason for the work: the mustangs! 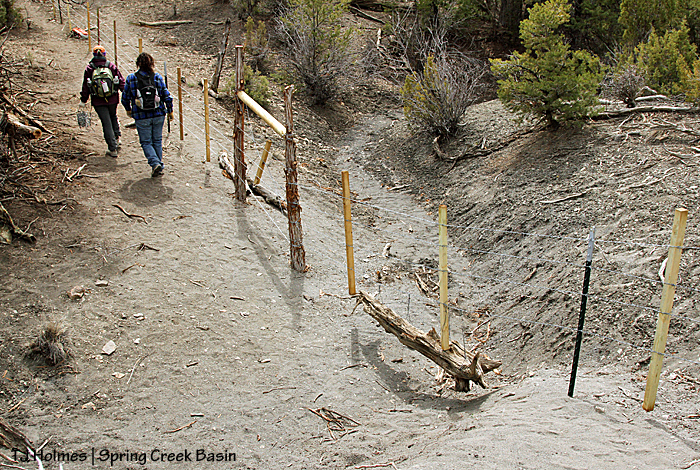 Tuesday’s work ended at a little arroyo that flows (when it rains) under the fence. The approach is fairly flat, but the north side is steep – and shaley (read: slippery). Tuesday, students built an H-brace on the flat side. 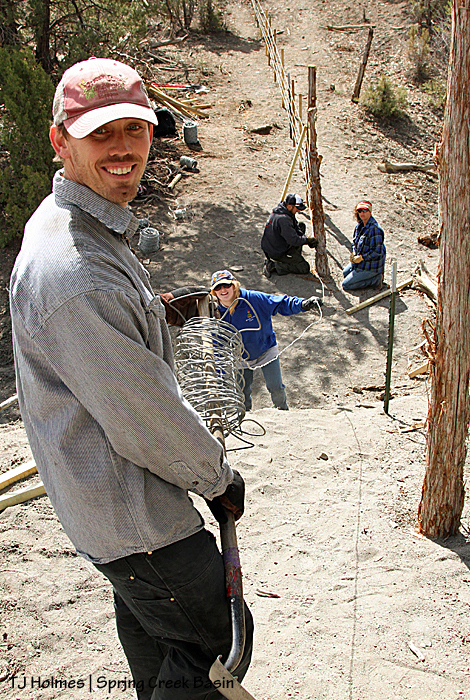 Wednesday, students ran wire up the steep slope to a newly-built H-brace (pictured is the brace built Tuesday). Students set up an impromptu relay system while carrying staves up the hill. Jake to Kyla in front, Sam to Dustin below, Casey and Chase bringing up the rear. It worked! 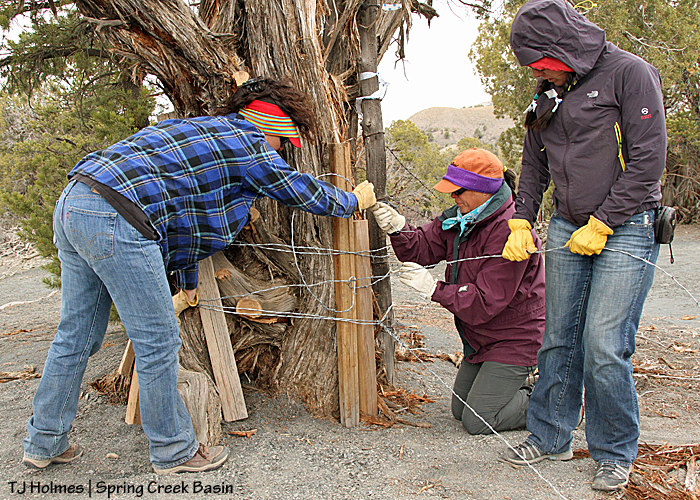 From there, students removed wire and ran new wire to the next stop – a big juniper that students padded with 2-by-4s (to protect it from wire). 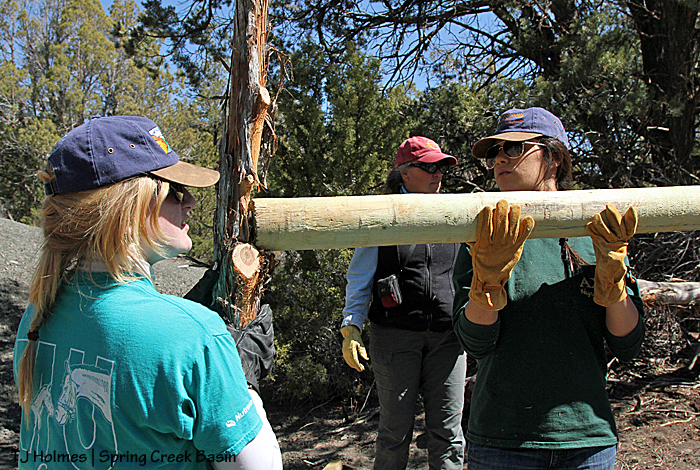 This photo actually shows the female fence leadership in place Wednesday: Tif, Kathe and MK. They tied off the second strand of wire (you can see the first, bottom strand already in place and tight). Go, girls! Ran new wire, four strands: Check. 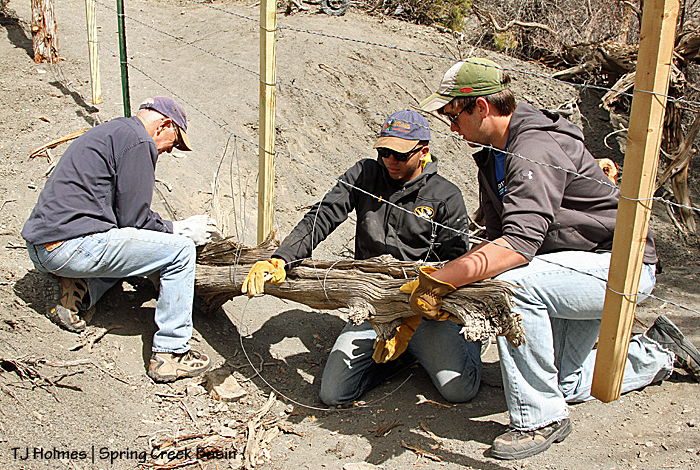 MK and Tom, both with San Juan Mountains Association, ran the last strand of wire from the padded tree to the H-brace while Grace, back right, helps channel the wire. 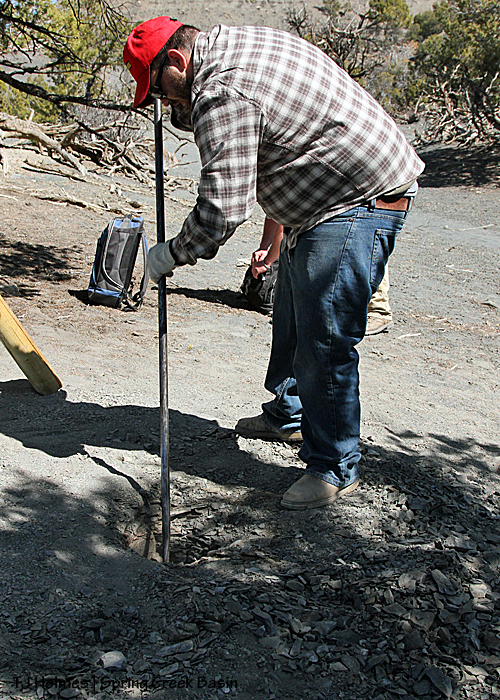 Dug post holes and built another H-brace: Check (oh yeah, and they carried these two thick, treated posts from the road just for this brace, at the top of the steep arroyo hill, to anchor the rest of the fence). Check, check! Here’s Chalen tightening the cross wires to strengthen the brace and Chris pounding in a spike (in a hole drilled earlier by Kevin) to secure the post to the cross piece. 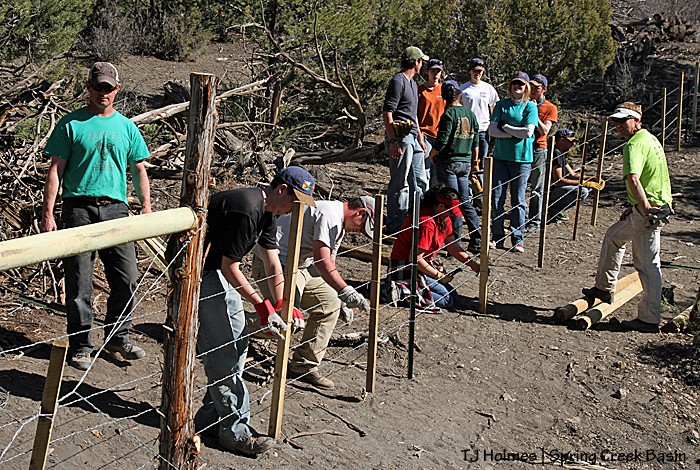 Ran wire up the steep arroyo hill to then tighten and attach to T-posts: Check and check. Kevin carries the wire up the hill while Tif, Chris and Kyla tie it off at the H-brace below. One more to show the steepness of the hill. Thank goodness it was just a short stretch! Installed staves: Check. Mark, Sophia and Kyla made quick work of it. Here’s a shot of MK standing right in the bottom of the little arroyo while she attaches a stave to the wires. Tom and Chase are just up the slope. It’s just a narrow little thing, as you can see from the edge of the H-brace at the right edge of the photo. 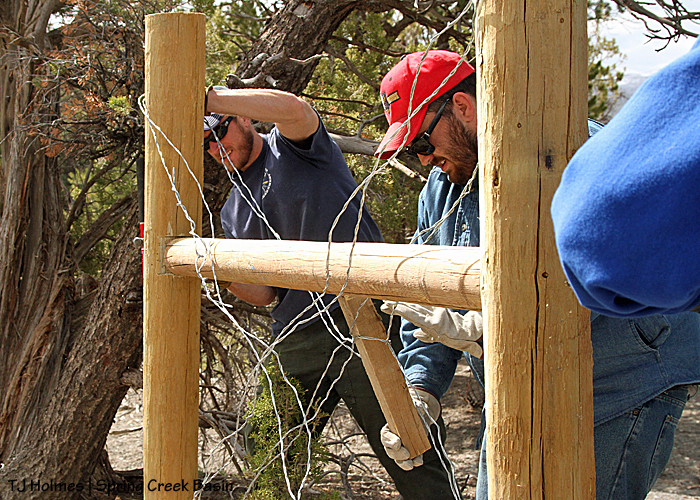 And one more project to finish off the whole deal: Dustin, Chase and Tom installed a “dead person.” Back story: Most fence-building crews call these a “dead man” – “dead men”? 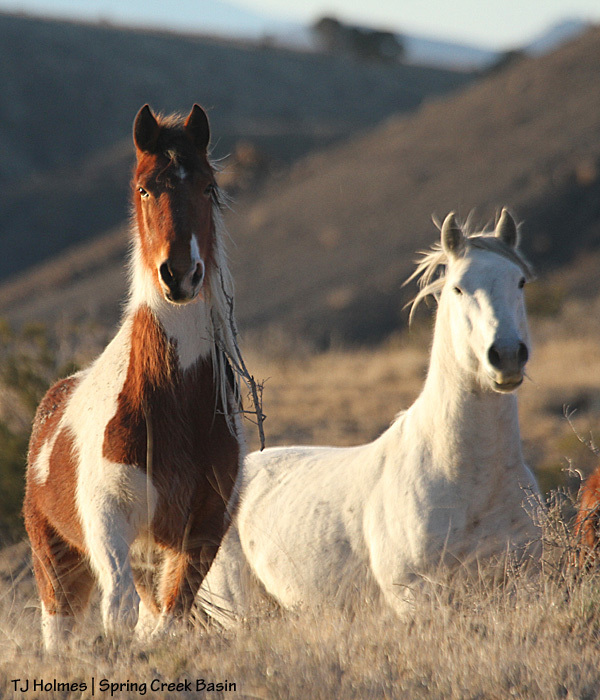 But being the modern folks we are, and not to exclude an entire gender, in the last couple of years, with fence-building guru Tom Kelly – recently retired from the Forest Service – we started calling them “dead persons.” We’re innovative like that. This old tree trunk fit the bill perfectly; it will block the gap below the wire, and it will swing with any seasonal flows that wash through the arroyo. 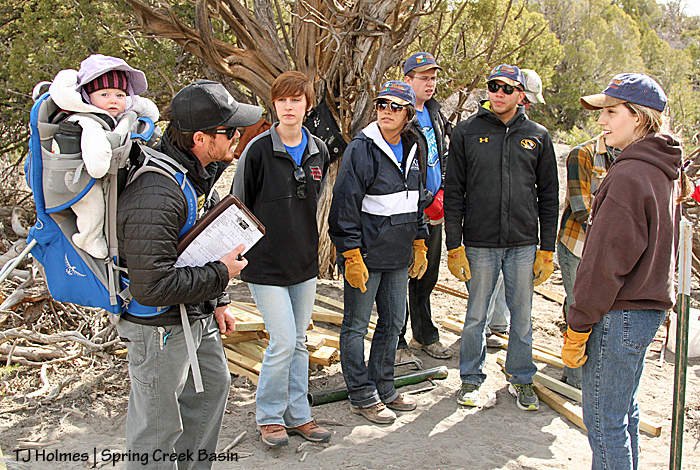 Kevin Heiner with Southwest Conservation Corps brought his daughter, Mariah, to check a potential work project for one of his crews next year in Spring Creek Basin. 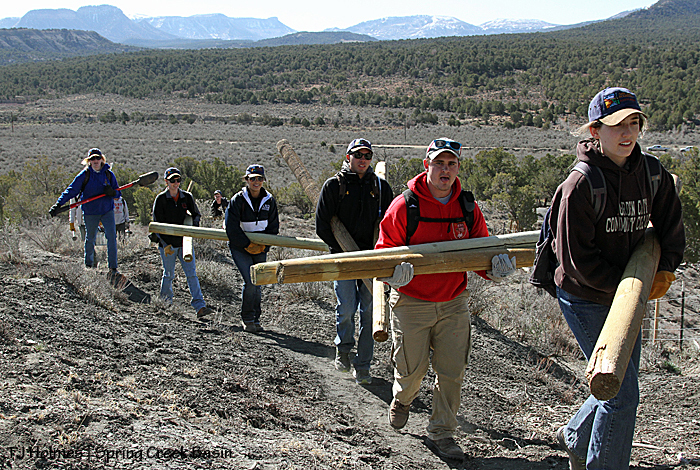 Kathe Hayes with San Juan Mountains Association is trying to raise funds to bring a crew here to tackle a VERY steep – and long – hill coming up on the fence line. The hope is that the SCC crew might work at the same time as next year’s alternative spring break crew from Mizzou in order to add another dimension to the partnership. While they were here, Kevin and his “executive director” also talked to students (Casey, Sophia, Mark, Chase and Grace pictured) about internship opportunities. 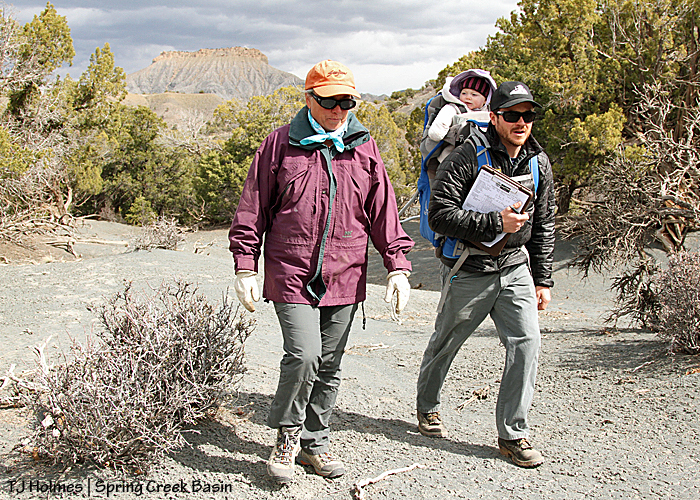 Baby Mariah looks like a future outdoorswoman who will complete numerous projects on our public lands, doesn’t she? Grand finale: Tif and Kathe follow the students to the vehicles after two days of work well done. How awesome is that fence?? Wednesday’s weather was quite a bit different than Tuesday’s: Somewhat cloudy, windy, cooler. 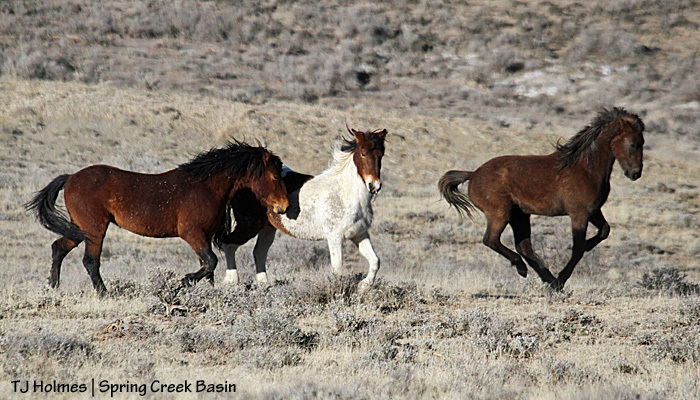 Grey skies greeted us as we drove east with the idea to drive into the basin to look for mustangs to show the students. We saw Ty’s band at a distance from the road. By the time we got to Road K20E, we decided that the grey we were seeing was dust, not rain, so in we went. Chrome’s band delighted us by being a little closer to view! And here’s where the good luck comes in. 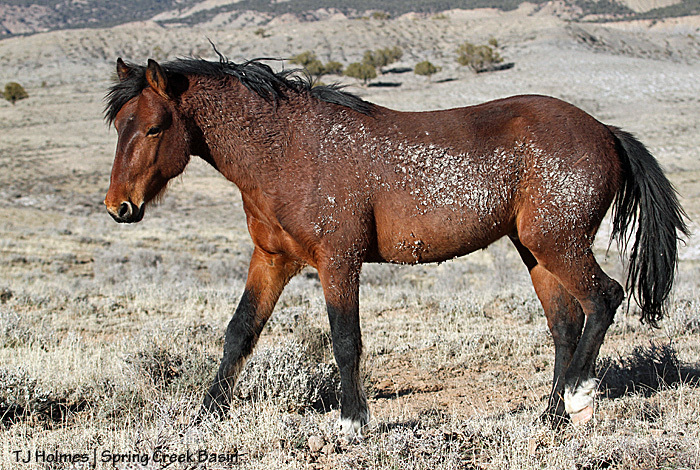 While it cut short our potential viewing of wild horses, the wind that stirred the dust also brought rain. Just a little. Enough to make the road the tiniest bit tacky. That’s more than we’ve had for weeks. Niiiiiiiiiiiiiiice! So, dear students, thank you, thank you again, from all of us, on behalf of our mustangs – which belong to all of you, too! Please enjoy the rest of your stay – Sand Canyon today? Travel safely back to Missouri. Come back and see us! We so appreciate all your hard work! Back row from left: Mark, Kathe, Chalen, Chase, Casey, Dustin and Sam. Front row from left: Damon, Grace, Sophia, Tif, Jake and Kyla. Thanks. 🙂 You all rock! We had sunshine. We had short sleeves. We had the flush of sunburn on winter-white arms and faces. We had, uh, shale? No beaches, but we had hard workers and fantastic attitudes. 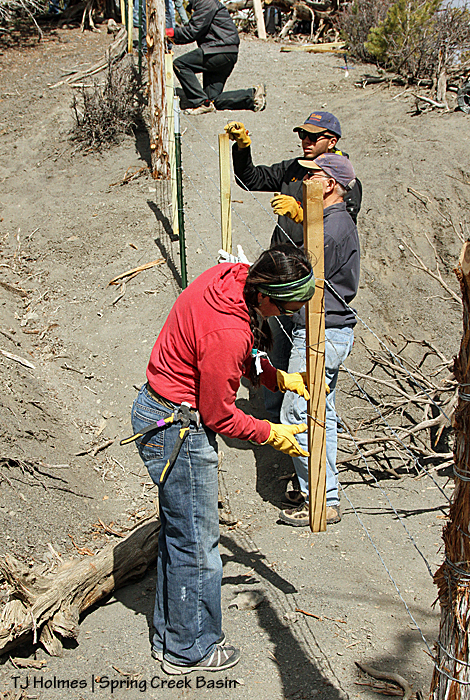 As usual, Mizzou sent some – 10 – excellent students to continue the fence-rebuilding project on Spring Creek Basin’s southeastern fence line as part of alternative spring break. 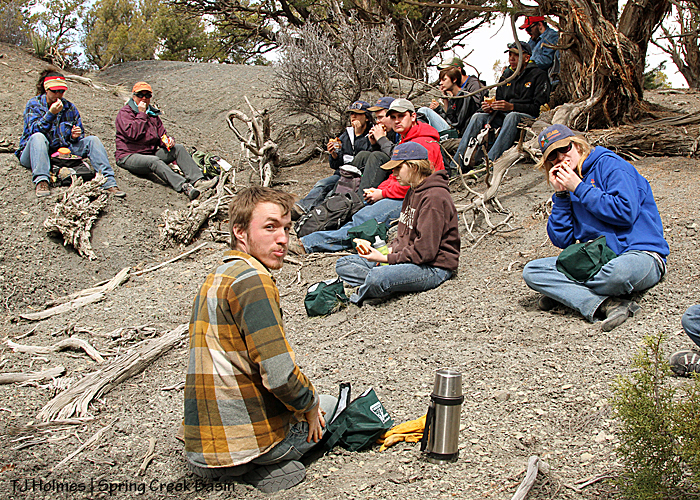 Leader Chalen said the number of groups working this spring break is 52 – up from 38 last year. If all you’ve heard about the next generation is a not-so-hearty endorsement, these students made myth of such statements. They ranged from freshmen to seniors, from undecided majors to finance, to animal science/pre-vet to fisheries and wildlife, to journalism. 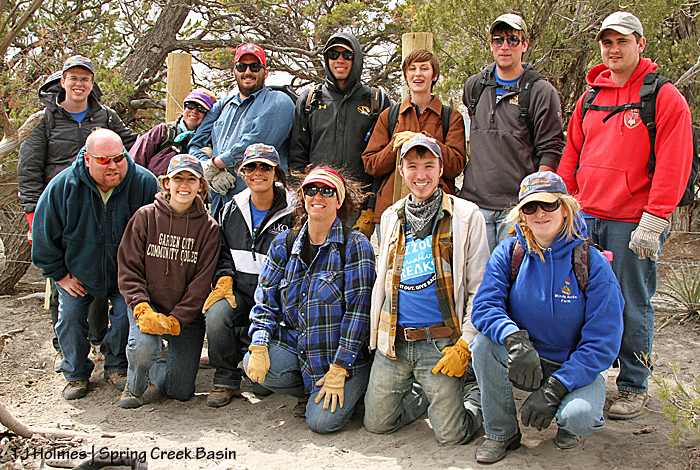 Every year, we’re grateful and excited to welcome them, and every year, a new group of students humbles us with their willingness to work on public lands very far from their Missouri campus. The sweatshirts didn’t last long. It was a gorgeous day in Disappointment Valley, and we were down to T-shirts in no time at all. Right to left: Grace, Sam, Chase, Sophia, Casey and Kyla. 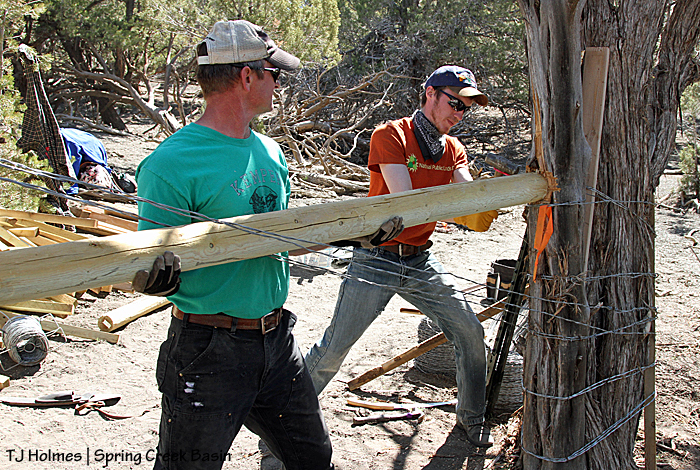 BLM range specialist and former herd manager Mike Jensen helps Mizzou student Jake set a cross piece into an H-brace at the start of the project. 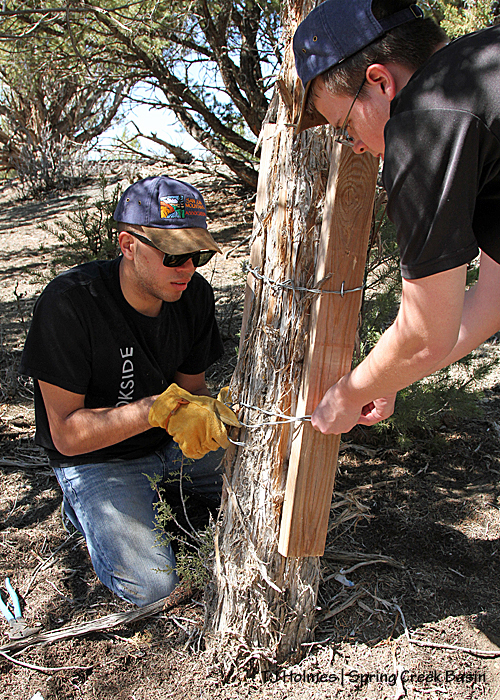 Students Chase, left, and Mark attach boards to a tree to protect it from wire fence strands biting into it. This is just up the line from the H-brace Mike and Jake are working on in the previous pic. 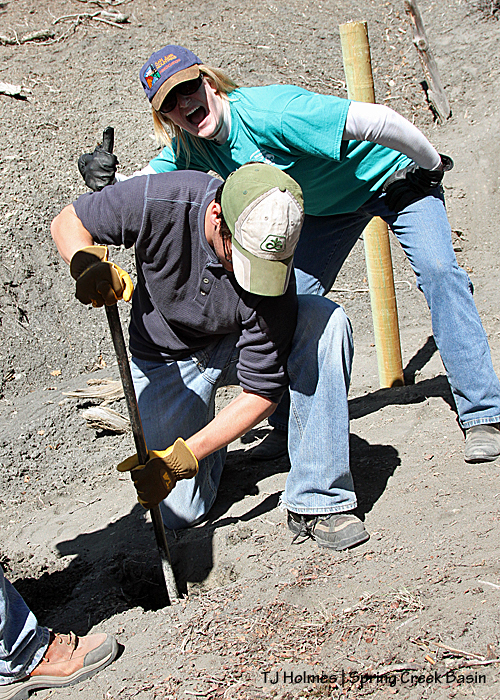 Student leader Chalen – who also was last year’s group leader – drew the short straw in digging this post hole with Sam. See all that rock? See the tamp bar? The only other tool they used was a post-hole digger. Same post hole – post in! Sam, right, tamps it in while Chalen and fellow student Sophia admire the work. 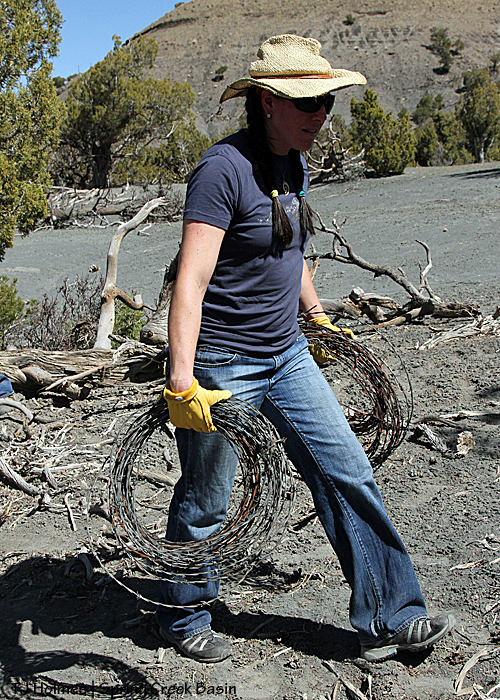 MK Thompson with San Juan Mountains Association carries out old wire strands that the students removed and rolled. A local Girl Scouts troop will pick up the old wire to recycle and earn some money! 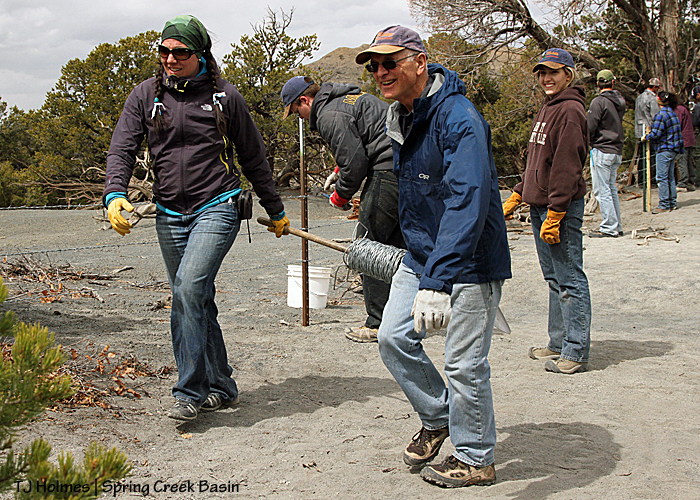 How about that for both recycling and partnership among local groups? Herd manager Damon Corley pounded his fair share of T-posts. 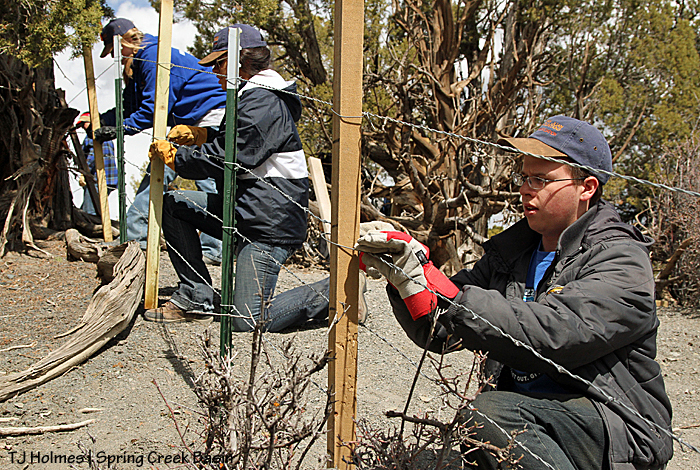 Part of the fence line was relocated to a straighter route, so posts were lifted out and reused or replaced. The lower wire strand was left in place temporarily to help align the new posts. Sorry, Dustin! While he was hard at work with a shorty tamp bar, Kyla bombed his photo – but gave his hard work an enthusiastic thumbs-up! 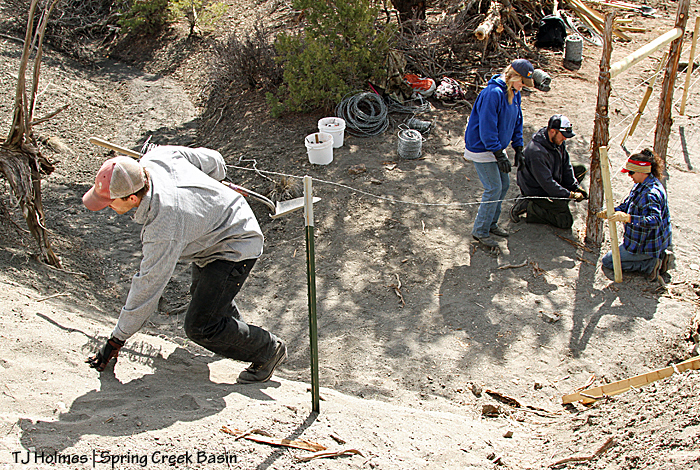 They and Casey (whose foot appears at bottom left) – and Sophia helped, too – dug two holes for an H-brace at the bottom of this steep little arroyo toward the end of the day’s work project. 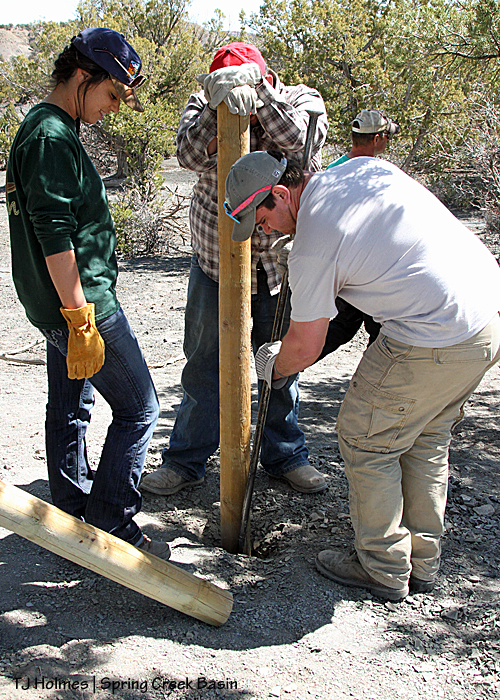 Sophia, right, and Kyla set the cross piece into the notches of the posts they dug holes to place. Kathe Hayes, mastermind of the alternative spring break week for many, many years (did I hear 17 years, Kathe?? ), supervises. 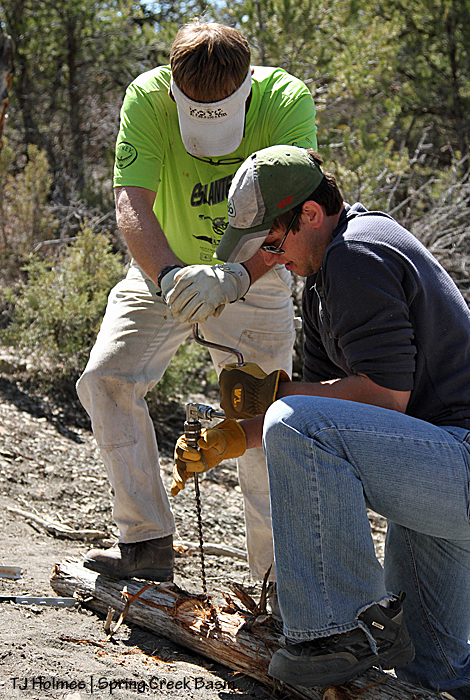 The Forest Service’s Tom Rice helps Dustin drill a hole for a spike to secure the soon-to-be-upright juniper post to the cross piece, as seen in the previous pic. 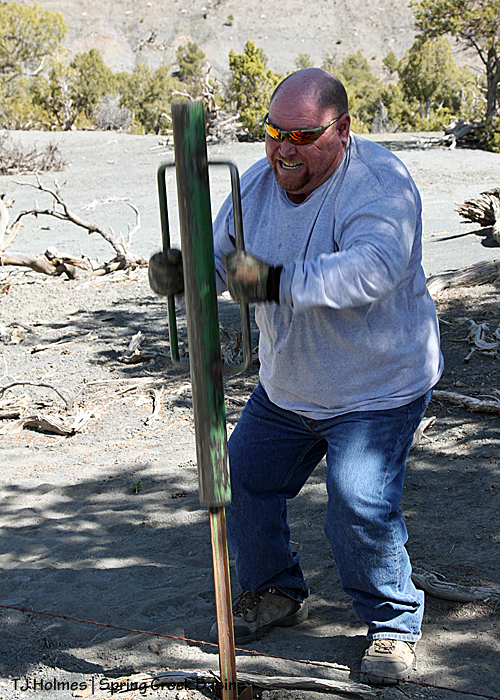 Remember, in McKenna Peak Wilderness Study Area, no mechanized tools are allowed. On this end of the brace, Dustin hammers home the spike while Casey steadies the cross piece. 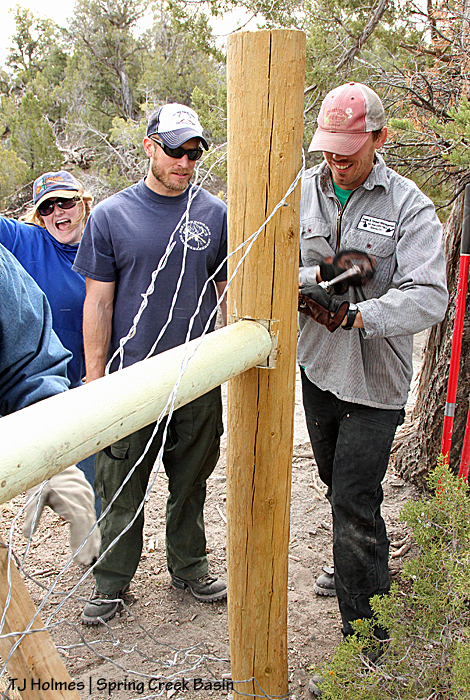 NMA/CO executive director and volunteer Tif attaches a clip to a T-post to secure a wire strand. Only the top strand to go! The top and bottom strands are smooth twisted wire, and the the middle strands are barbed. We’re using wildlife-friendly wire spacing on this entire line (I think that’s usual now for Forest Service and BLM fences). 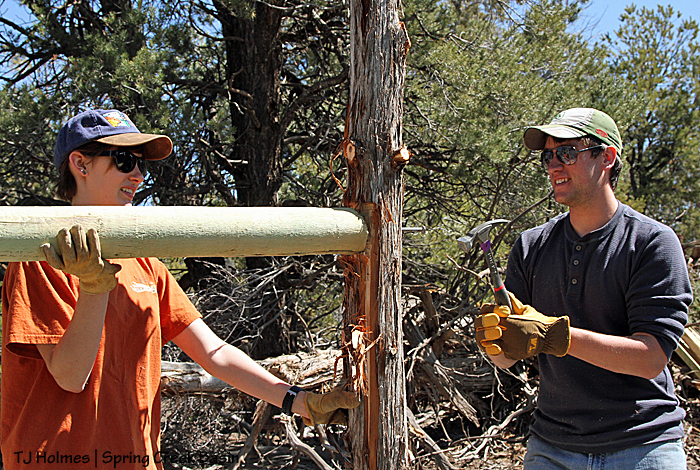 Jake holds one of the measuring sticks used by students to attach the wires at the right spacing while Casey attaches a strand to the T-post with a metal clip. The students were so “on the ball” that hardly had a wire strand been tightened and tied off at the H-brace than they were attaching the strands to posts and staves to wire. Wow, they were fast! 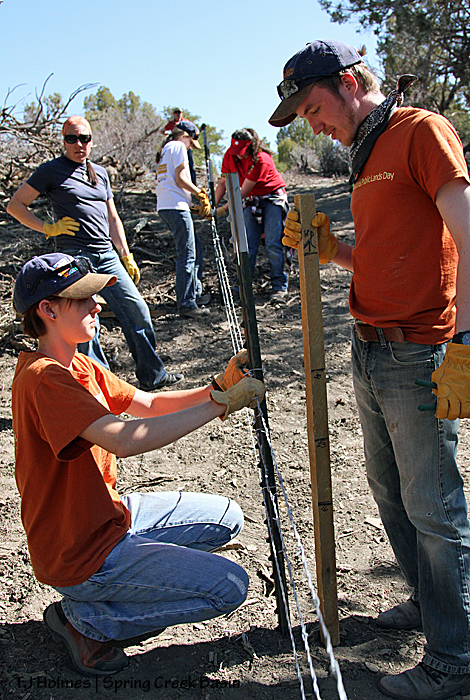 Some of the students have fence-building experience, but most don’t. Quick learners, these college students! This shot is a little out of order, but it’s a good contrast to the previous pic, which shows the nearly-finished fence. 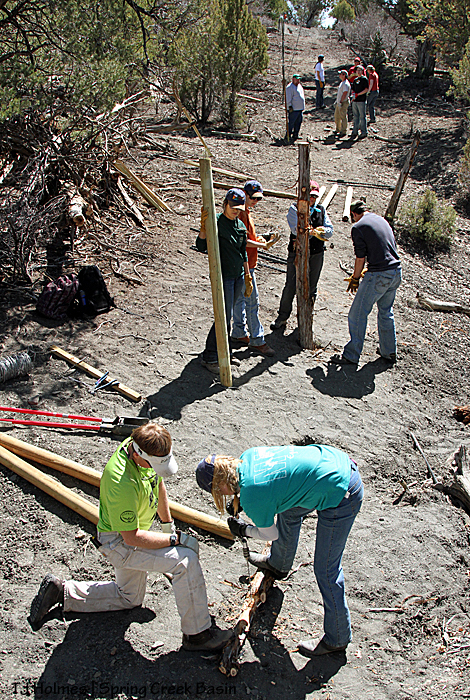 In this pic, taken from about halfway up the steep bank of the arroyo at the end of the day’s work section, you can see Kyla and Tom drilling a hole in one of the juniper H-brace posts while Dustin, Kathe, Casey and Sophia have set their post and are getting ready to tamp dirt in around it. When the H-brace is completed, wire will be strung – from the bottom wire up – clips will be placed, staves will be set, and we’ll call it a day well spent! … where we took the obligatory group shot. Back row from left: Damon, Mike, Kyla, Sophia, Dustin, Casey, Chase, Grace, Chalen, Sam, Mark and Jake. Front row from left: Tom, Connie, Kathe, Tif and MK. We really can’t say “thank you” too many times. 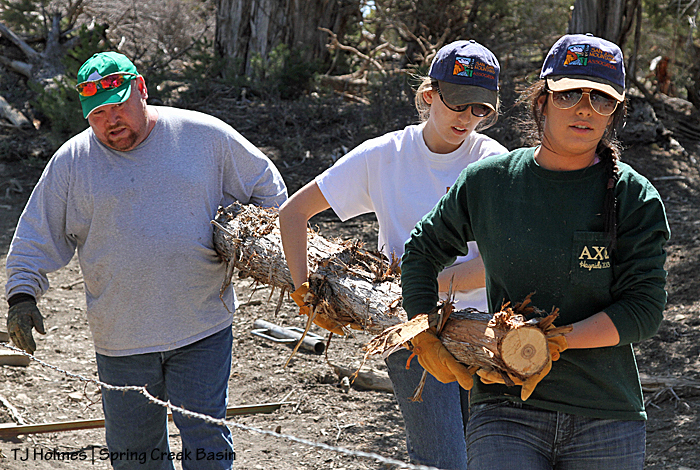 Mike, Tom and Connie won’t be joining us for the second day of work, but the students, Kathe, Tif and MK will return along with a couple of wildland firefighters Kathe conned encouraged to come. Puzzle looks stylish while sporting some mustang bling during a visit with Seven’s band. Don’t they look spectacular? !